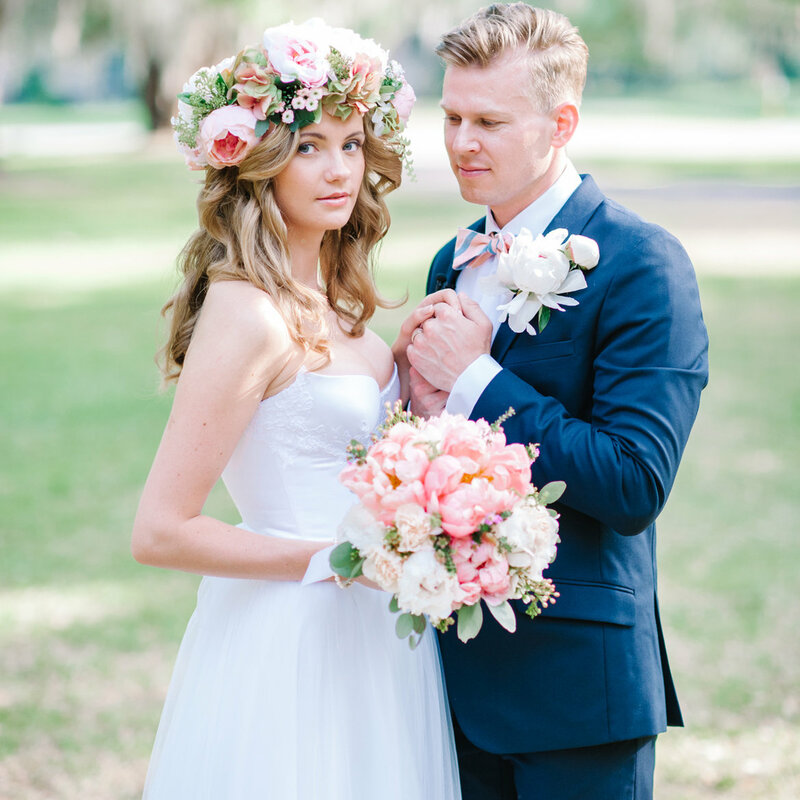 A lush pastel peony headpiece set the tone for a dreamy Southern destination wedding. Plus, check out more gorgeous ways to wear your hair down. A matching floral crown-bouquet ensemble gets your boho vision across. Vibrant purple blooms, miniature white daisies, a lace-edged veil, and a back-baring dress — everything about this look screams "summer!" Berries add an unexpected and fun touch to your little one's crown. An asymmetrical design adds glamour without overwhelming the face (wear it on the side your guests will see when you say "I do"). Getting married in a destination affair? Incorporate local flora and fauna, like this Hawaiian-inspired headpiece. A tropical take on an asymmetrical design fit the relaxed vibe of this wedding in Mexico. We love the addition of cascading pink flowers to this bride's main crown. At first glance, a fur wrap and floral hairstyle may appear to be total opposites, but the muted color palette makes it seasonally appropriate. An illusion neckline paired with a crown of roses imparts an ultra-romantic vibe. Choose blooms in different shades of your color palette to pull everything together from a visual standpoint. Is there anything more angelic than a procession of flower girls decked out in white and peach petals? We think not. Allover greenery creates a dramatic look that's fit for a goddess. A loose and leafy crown with sporadic blooms adds a youthful feel to a modest gown with long sleeves. Bonus: This type of crown is just as pretty on a cherubic flower girl as it is for the bride. This bride flipped the script at her vintage-inspired nuptials by outfitting only the 'maids in floral crowns. A blusher veil paired with a floral crown creates a dramatic look that's best suited for a simple, pared-down wedding gown. This half-up hairstyle is perfect for a classic fairy tale wedding. The only thing more beautiful than a side-swept braided hairstyle is one embellished with miniature blossoms. Accent your waterfall braid with textural flowers for a whimsical vibe. The flowers elevate this bride's side pony into wedding-worthy status. Show off ultra-long locks with a milkmaid braid and floral headpiece. Complement a modern-day Cinderella ball gown with a gorgeous updo woven with flowers. A sprig of greenery is a chic addition to a loose braid. Adorn a low braid at the nape of your neck for a look that's stunning from all angles. Pretty-in-pink blooms add polish to a braided headband 'do. Accessorize a low updo with flowers from the same color family. We love how this bride added a bold pop of color to her dark upswept locks. Take a cue from this stunning bride, and balance out volume at the crown with coiled flowers at the nape of the neck. This loose and organic floral arrangement is one of the most unique that we've seen; plus, how pretty is this color palette for an autumnal wedding? Photo Credit: NovaMarkina Photography / Event Design: Twelfth Night Events / Florals: Something Blue Floral Design / Makeup: Makeup by Brittany / Hair: SOMA HAIR CO.
We love this creative twist on a standard floral crown! Who knew that such an inexpensive and dainty flower could have such a beautiful visual impact? Baby's breath adds a dose of charm to an otherwise simple twisted half-up style. Here, baby's breath is used in place of a barrette and artfully arranged into a twist of hair. Upgrade a classic chignon with some inexpensive but lovely baby's breath. We love how this bride styled her baby's breath off to one side — she looks stunning! Cluster baby's breath into a garden-gorgeous crown for your flower girl to wear. A ribbon bow adds an adorable touch to this elegant baby's breath wreath. This bride's passion for Mother Nature influenced her wedding-day attire, including this lovely branch-inspired headband. Choose a slightly different headpiece variation for your flower girls, like this two-stranded stunner. Roll and twist a face-framing section of hair, and pin it with a few choice buds. Clip up the top half of straightened locks, fasten with a floral clip, and voilà — you've got a bridal-ready hairstyle. This beautiful updo featuring petals and a blackberry made us do a double-take. Here, petite flowers are used with a graceful effect. A large blossom adds oomph to a chic graduated bob. A single anemone is the showpiece of this bride's elegant look. An updo with this much pizzazz stands out even against a floral-covered ceremony canopy. This elegant look is reason #101 why we adore orchids. Recreate this bride's radiant look by pinning your veil beneath a white blossom. We spotted this beauty at a rustic barn gathering, and we've been smitten ever since. Choose contrasting hair accessories for your ladies so that you stand out among the group. This floral accessory exudes romance and sophistication. A headband with fluffy flowers was the cherry on top of this bride's ethereal and rustic wedding-day ensemble. We love this unique idea! Instead of a traditional veil, this bride wore cascading flowers in her hair.